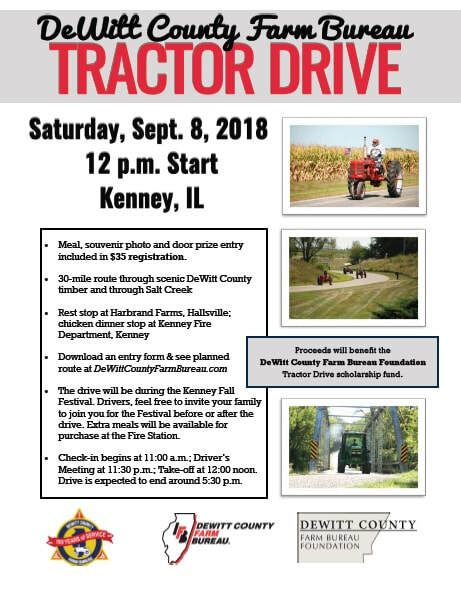 CLINTON, ILL. – Organizers announced Friday the cancellation of the 2018 DeWitt County Farm Bureau Tractor Drive due to forecasted rains and expected wind for Saturday, Sept. 8. 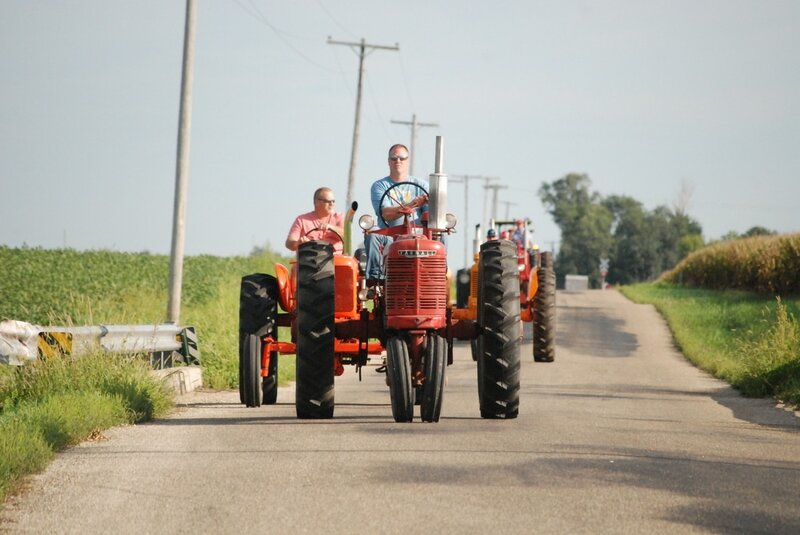 The drive, which raises funds for the DeWitt County Farm Bureau Foundation, was scheduled to depart the Farmer’s Grain Elevator and Excel Railcar Grounds in Kenney at 12 noon on Saturday, and travel about 26 miles before returning to Kenney at about 5:30 p.m.
Because many of the drives’ volunteers are farmers, it will not be rescheduled for this year due to proximity to fall harvest. Drivers who pre-paid will receive a full refund. Despite the rains, which forecasters say are remnants of the tropical storm Gordon, the Farm Bureau encourages residents to keep the Kenney Fall Festival in your weekend plans as events including the Kenney Fire Chicken Supper will continue. DeWitt County Farm Bureau thanks its Drive sponsors: AHW, Inc., Anderson Ford, Baum Chevrolet Buick, Central Illinois Ag, Douglas Dodge Ram, and Farm Credit Services. Questions may be directed to DeWitt County Farm Bureau at 217-935-2126. WHEN: Saturday, Sept. 8; Registration at 11 a.m., Driver's Meeting at 11:30 a.m.; Take-off at 12:00 noon. WHO: Drivers ages 16 & up with valid drivers' license. You do not need to be a DeWitt County Farm Bureau member to participate. COST: Cost for the drive is $35, which includes dinner and rest-stop snacks for driver. Extra dinner tickets may be purchased on-site. Entry also includes door prize ticket and a souvenir photo. WHY: Proceeds fund the Foundation's Tractor Drive Scholarship. For the scholarship, first preference is given to DeWitt County students studying mechanics, welding, electrical and other trades. If no candidate meeting such criteria is available, students studying a general agriculture field are eligible. Interested candidates may apply in Spring 2019. B. Download entry form and mail/drop at office. Cash/check payment ($35/tractor) is accepted at the office, via mail, or at the registration table on the day of the event. Pre-registrations are not required, but are appreciated by Wednesday, Sept. 5. About 30 tractors took part in our 2016 Tractor Drive, enjoying a scenic view of DeWitt County, including the Clinton Lake area. Participants also enjoyed lunch prepared by the Clinton FFA while they visited Triple M Farm during the DeWitt County Farm Crawl. Our 2016 Drive benefited DeWitt County Farm Bureau Foundation.